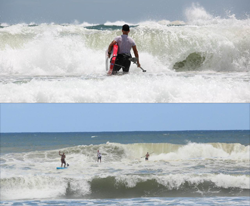 Results from the 12 Towers Ocean SUP Race held on the Gold Coast, Australia. Conditions were awesome, with a good tail wind kicking in right before the start of the race to make for some super fun downwinder conditions. There was a fair bit of swell though, which made it pretty tough getting out the back to the start line (and even tougher getting in to the finish line…). Travis Grant put in a huge effort to beat an all-star field, narrowly edging out Jamie Mitchell. Amazingly, both finished the roughly 13km course in under an hour. Local young-gun Jake Jensen took the final podium spot in a three-way battle with fellow Gold Coasters Beau O’Brian (4th) and Paul Jackson (5th). The competition was intense on the women’s side as well, where New South Wales’ Terrene Black snatched victory from local favourite Angie Jackson. Massive effort by the organisers, SUPSA, in pulling off such a great event. Huge credit also for the crew at Watershack.com.au, who stepped up as the major sponsor of the race. Click “Division” to sort results by Age Division. Click “Overall” to reset the results.